LUCY BURDETTE: We were going to talk about the relative messiness of our desks today, when we realized we'd overlooked Veterans Day. So the smaller question of messy workplaces will come later this week, as today we remember and celebrate the veterans from our own lives-- and all the men and women who made sacrifices to serve our country. I have a number of veterans in my family--my brother served in the Marines for 25 years, my father-in-law served in the Navy, my husband served in the Army during the Vietnam years, and my father served as an Army engineer in Europe during World War II. My dad stayed in touch with his Army Corps of Engineers right up until the year he died. I often think this experience was the most important of his life. He bonded fiercely with his fellow soldiers and was fiercely proud of his service to our country. For my father and all veterans, I salute you! RHYS BOWEN: Remembrance Sunday is a big deal in England. Everyone buys a poppy to wear in their lapel. I remember going to the Cenotaph in Whitehall, standing on a cold, bleak, November day watching the parade and the queen laying her wreath on the tomb of the unknown soldier.... with tears running down my cheeks. Also watching the service at the Albert Hall the night before when poppies fall from the ceiling. My father served in World War II and was in North Africa then in Palestine. He took part in El Alemein. And it's funny, Lucy, but in many ways it was a highlight of his life. The intense camaraderie in the face of such hardship and danger made men know they were alive and appreciate every little thing. All my uncles were also in the British forces during the war--army, air force and navy. I think that war was the last time we had a clear knowledge of good versus evil and evil had to be stopped. Since then all conflicts have been gray areas, haven't they? SUSAN ELIA MACNEAL: My godfather, Al Dorr, served in the Vietnam War. He then continued in the Army Reserves, and was part of the force deployed to New York City after the events of September 11. I know I felt better with him there! Also, my father and grandfather served in World War II. Hats off to all our veterans. 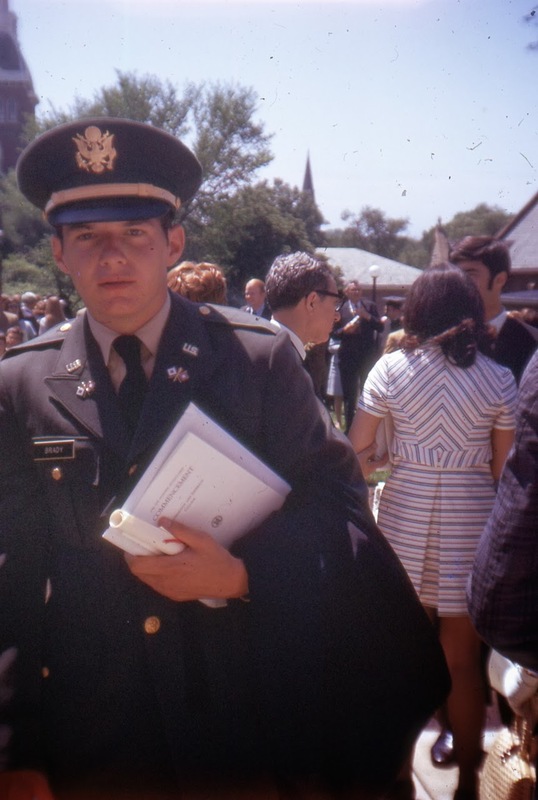 HANK PHILLIPPI RYAN: My father was in the Battle of the Bulge. You have to imagine it--there he was, a bookish, musical, thoughtful 18 year old--he and high school classmate Kurt Vonnegut were captured by the Germans and taken to a prison camp. I say "taken"-- in reality, they were marched through the snow. Dad got a Purple Heart, and will not discuss it. Not a word about any of it. For years, all I knew what that he and Vonnegut would trade their cigarettes for writing paper. Several years ago we were in someone's house, in their library, and Dad saw a paperback edition of an Untermeyer poetry anthology. He pulled it from the shelf and said--this is just like the book of poetry I carried with me during the war. I said-you carried a book of poetry? Why? And he said--to remind me there is beauty in the world. DEBORAH CROMBIE: Hank, what a wonderful story about your dad. My father didn't serve in WWII. He was already in his mid-thirties, with a business and a young child (my older brother.) He was such a gentle, sensitive man that I can't imagine he would have survived it. Both of my mother's brothers served. 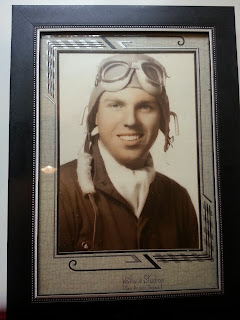 The dashing Air Force pilot in the photo is my uncle Bill Dozier. Neither he, nor my uncle Tom, who was in the Navy, ever talked about their war. 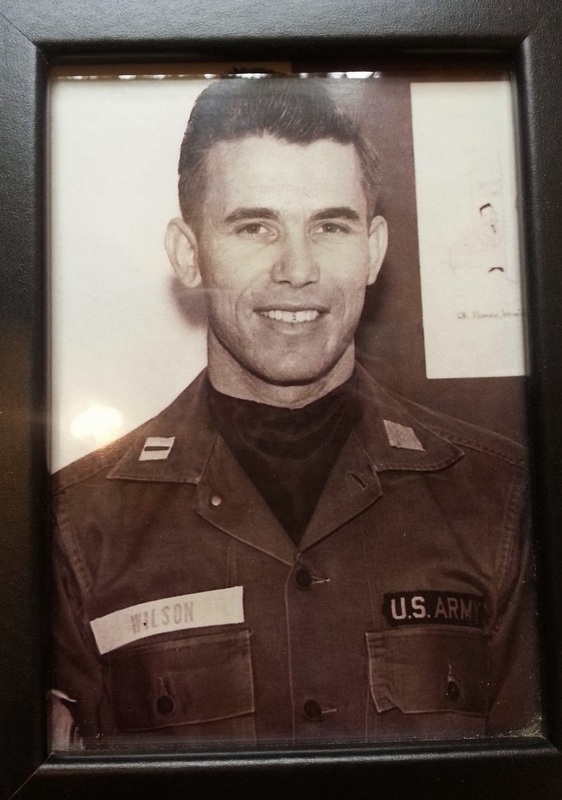 My husband's father, Paul Wilson, was an army doctor in Germany in the late fifties. He never saw battle but still served his country. Reds, any special Veterans you'd like to tell us about today? My husband served in the Navy, both active duty and reserves. Our oldest daughter graduated from the Air Force Academy and served in the Air Force; her husband also served in the Air Force and is now in the Reserves. Our youngest daughter is in the Navy . . . . So many have selflessly served, so many have sacrificed to defend our country, to preserve our freedoms . . . it’s a debt we can never repay. Marty joined the Army after Pearl Harbor, ended up in France, chasing Germans from ridge to ridge following D-Day. Standing by a tree, Marty fired at a German on the next hill, watched the German lift his rifle, saw a puff of smoke, felt a punch in the chest, then heard the shot that darn German fired back. Marty -- an old editor I worked for -- showed me the scar. Thanks for sharing your stories Joan and Jack! All the men in my mother's family--her three brothers, and four brothers-in-law--all served, some during wartime and one during peacetime. mostly in the Navy. One of my uncles was a POW in WWII for several months. When he was released and returned to his young bride, they were never again separated for the next 50+ years of their lives together. One cousin went to Vietnam while in the Air Force, and he's never been the same since. He won't talk about it, but his eyes are still haunted, all these years later. War is crap. Some sacrifices should never have to be made, all for the vanities and greed of (mostly) men. I thank them for their sacrifice, but wish heartily the need for such sacrifice was never necessary. Like Hank's father, my dad wouldn't talk about WW II except to say that his company in the Army Air Corps followed Patton across Europe. He refused to go to company reunions. Eventually, I figured out why. It was part of his job to pack up the effects of those who were killed and send them home. He didn't want to remember how many friends he'd lost. I'd like to say hats off to our women veterans. There's a great article today on female WWII heroes — those who trained as spies and went on covert missions during the war. Not all vets have stories of glory, but played a vital role nonetheless. Two that come to mind are my father-in-law, whose bad eyesight could have easily exempted hiim from service. I suspect that he may have memorized the eye chart to pass his physical. Somehow, the army figured out that giving him a firearm was not a good idea. His war was spent on the troop ships ferrying soldiers through the submarine infested North Atlantic entertaining the boys bound for battle. A younger vet who comes to mind, was a cook on the aircraft carrier that launched the first strikes on Afghanistan after 9/11. His main task was to make sure that the pilots had fresh cookies on their return. Thank you to all the veterans and the families that they leave behind. It is because of their sacrifice that we are all able to live the lives that we do. He was in all the major battles in the Pacific, but would not talk about them. When I was in high school and studying world history, I asked him specific questions about the battles he was in. He burst into tears and left the room. Over the next few years, I slowly realized that all the stories he had told us were about the friends he made and never had anything to do with the war itself. He never had any interest in attending reunions. I think he didn't want to relive the more horrific events. He kept in touch with just a couple of people he met in the Navy. My shy intellectual father was drafted for WWII and trained in Italian at UC Berkeley, and then they sent him on a boat to the far reaches of India to man a radio relay station! He created and distributed a ship newspaper, and spent most of his time in India writing long letters to my mother, his fiancee at the time. I'm not sure he bonded with any of his fellow Army guys, but he kept up his writing throughout. Susan, you are so right about saluting our female heroes. The ones that come to mind are the women pilots who delivered aircraft of all sizes to the bases where they were needed. Some of these planes crashed and the women were killed. BUT because they were not officially members of the armed forces they got no burial or death benefits. I am in awe and gratitude to anyone who served (serves) in the armed forces. Thelma - what an incredible memory. We had many friends who served in Vietnam and still the memories are part of who they are. Fortunately we didn't lose anyone near and dear. **My father served in World War 1 having been born in 1895. He was in the navy on 2 different ships,stationed in Ireland. He never talked about his service. We have only a picture of him in his uniform. This would have meant that he was 19 or 20 while serving. He survived the loss of 2 ships he was on to submarines. The only comment he ever made about the picture of him in his uniform was "all" the hair he had. Men of his generation didn't talk much about anything. His focus was working , providing for his family and caring for his racing pigeons. He lived through the WW1, the Depression, WW2 , & cold war. The amount of history he "lived" is staggering when you think about it. My grandpa served in the Navy, and it was his stories from the South China Sea that inspired my first novel. He was also on a ship just off the coast of Japan when the U.S. dropped the atomic bomb, and the only time I ever heard him speak in anger was when he spoke of the innocent people killed that day. He was such a kind person and I can only imagine how painful it was for him to see some of the atrocities that wartime brings. It is an honor for me to be able to honor him not only on special days like today, but every day. What wonderful and moving stories. 3rd ID, Tip of the Spear, in the more recent Iraq war. I'm very proud of them all. Hank, what a powerful story about your dad. Wow. Lucy, my dad was also with the army engineers in Europe. I remember one story in particular. On Christmas Eve, he and his buddies came roaring over a hillside in rural Germany, lost control of their vehicle, and crashed into a village Christmas tree, knocking it over. Imagine a bucolic village a la The Grinch Who Stole Christmas, and -boom- does goes the village tree. Proud of all our vets, proud of my family: husband AF, son Navy, grandson Army just returned from tour in Afghanistan, grandson Marines currently serving in Okinawa. Now we just need a great-grandchild to join Coast Guard! My Daddy served in WWII in the Army, he was a medic, war was not something he cared to talk about (can't say I blame him or others who don't want to relieve the horrors). Donny (hubby) was working in Wash DC late 80's, it was a 6 month job, so his boss flew me up for a long weekend. I had never been to DC before, there were some places I wanted to see, Lincoln's memorial, The Church of the Immaculate Conception (largest catholic church in US) and the Viet Nam wall. Lincoln's memorial was impressive, I had no idea how large it was. But the Viet Nam Wall, wow, it was so emotional, to run your fingers across all those names, see Vets and family members sitting or standing while tears streamed down their faces.....brought me to tears. This is the first time in 46 years that my husband will not be in uniform to mark Remembrance Day. He served in the army all over the world and I am so very proud of him. My grandfather RA WWI, my mother WRAF, father in-law RCN, aunt, uncles WWII all who served that we might live in peace and freedom. My sister, Patt, served in Vietnam as an Air Force nurse. She made a career of the Air Force and served overseas a couple of times. She volunteered for Vietnam and tried to get re-instated for Afghanistan but she was too old and her health was not good Patt is now buried in Arlington National Cemetery which was her lifelong wish. My father enlisted not long after Pearl Harbor, he was 31 years old, but not married yet and felt he had to go. He spent 44 months in the Army, serving in North Africa and ending in Italy. He would talk about the places and the men he served with, but very little about the actual war. My dad wanted to serve in World War II but couldn't because he was, as he said, "100% deaf." Deaf as the result of meningitis. And yet he was drafted and reported to duty at Fort Leavenworth, Kansas in early 1942. He often said that during the physical exam because they "kept trying to trick me into proving that I could hear." He would have been one of those invisible handicapped men, and he minded not being able to do his part. 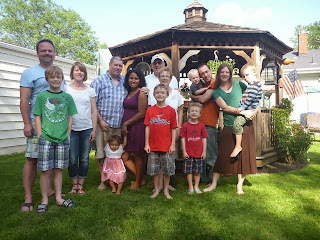 Thanks again to all for sharing your family stories. Karen I'm totally sympathetic about war being crap...but still salute the vets who felt they were doing what they needed to do for their country. I was lucky to be an Air Force wife for twenty years. Moving around the country was a privilege. I met the best people. Living at Hanscom Air Force base in Massachusetts lead to meeting Roberta, Hank, Hallie and Rosemary!